21-year-old Spencer Roe from South Hykeham, Lincolnshire with his mother Sally’s 11 year-old bay gelding Wonder Why helped Team GBR win the fourth leg of the 2014 FEI Furusiyya Nations Cup series held St Gallen, Switzerland on Friday 30th May. Their victory made it the second year running that GB have claimed the title as their own; a victory that World Class Showjumping Performance Manager, Rob Hoekstra, couldn’t have looked any more pleased with when he walked his team into the arena for the prize giving. Making their debut at this 5* Nations Cup level was Spencer and Wonder Why. If they were feeling the pressure, it certainly wasn’t noticeable with them putting in a brilliant performance to return home with just the one time penalty having stopped the clock just outside the time allowed. At the end of the first half, Great Britain had secured themselves into the lead as a result of some brilliant performances and the team finished on just the 1 penalty to take the lead at the halfway stage. In the second round Spencer put in yet another brilliant performance to mirror his first. Deciding to keep on the steady pace that he had ridden in the first rather than rush Wonder Why and risk a mistake he returned home clear and just outside the time allowed. Finishing on just 3 penalties across both rounds, Team GBR managed to hold on to their lead despite Spain having been hot on their heels throughout the competition, Sweden took 3rd place on 10 penalties with home nation Switzerland finishing in 4th on 14 penalties. Talking afterwards Rob Hoekstra commented “To say we are delighted would be an understatement. As a non-point scoring leg of the series for us we came out with a team of younger horses to give them experience of competing at this level along with some younger riders who are still very much cutting their teeth on senior teams. To win today, once again shows the world what tremendous talent we have across all levels within the sport. There wasn’t one horse or rider that wasn’t superb – they all put in brilliant performances and I am honoured to be here with them today”. For Great Britain, it was definitely a day to celebrate. As one of the non-point scoring competitions (league points are only competed for at four of the eight legs of the series), Rob had selected a team of horses which he felt would all gain from the experience of competing at this level. For them to have come out and claimed a clear victory by the time the third team rider had finished their second round would have surpassed his hopes and expectations which were very much to just give each of the horses added depth to their international careers. Further information and full results can be found by visiting www.csio.ch. Full information in respect of the Furusiyya FEI Nations Cup series can be found by visiting www.fei.org. 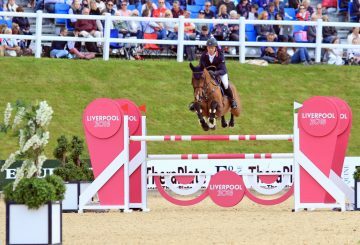 The British Showjumping Teams are supported by Exchequer and National Lottery funding via UK Sport. Amateurs Ride Off for a place in TSR/HOYS Master Class!